The University of Detroit Jesuit High School and Academy’s new $16-million STEM center in Detroit could easily be mistaken for a research and technology center operated by a Tier 1 automotive supplier. >> advanced track The University of Detroit Jesuit High School and Academy in Detroit added a $16-million STEM center (middle building). 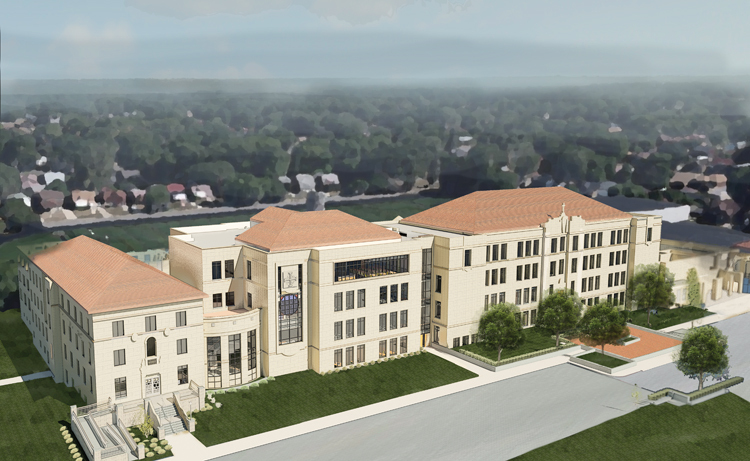 The four-story, 40,000-square-foot facility houses biology, chemistry, and physics labs; classrooms and an assembly area for the school’s eco-car and robotics programs; and mills, lathes, and other engineering equipment. It replaces a one-story structure that adjoined the school’s main edifice. Tom Totte, vice president of institutional management, says UDJ officials toured several universities and high schools to benchmark the design and layout of the new complex, which was paid for with private funds. “One of the components we added, based on conversations with Cranbrook Schools (in Bloomfield Hills), was to add chambers with glass doors so students could safely pass their chemistry projects from one room to the next,” he says. The 900 seventh- and eighth-graders enrolled in the academy have a dedicated classroom and laboratory in the new facility, while their high school peers occupy the rest of the structure. “As a college-prep school, we felt it imperative to prepare our students for the next road on their scholastic journey,” Totte says.